The American Beverage Institute (ABI) states that its mission is to "promote responsible alcohol consumption." Actually, its primary focus is opposing any lowering of the legal blood alcohol limit for drivers, and fighting smoking bans in bars. The organization is run by lobbyist Rick Berman, whose company, Berman & Co., represents the restaurant, alcoholic beverage and tobacco industries. Berman is quoted in numerous articles as the legislative counsel for the group. He consistently defends "social drinkers" and speaks out against any laws or media coverage that negatively affects the industry. In this capacity he has been a longtime foe of Mothers Against Drunk Driving (MADD). The American Beverage Institute's recent propaganda includes their "Drink Responsibly: Drive Responsibly" campaign. The group refuses to accept the fact that "responsible" means different things to different people. They call MADD and others who work to reform alcohol policies "Neo-prohibitionists" to suggest that they want to infringe upon the average American's right to enjoy the alcoholic beverage of their choice, and to paint them as "Carrie Nations" to be feared. Working to link public health efforts to control a dangerous substance to Prohibition in the public mind is a PR strategy first carried out on a scale by the R.J. Reynolds tobacco company in its Project Breakthrough. The American Beverage Institute and Rick Berman are listed in a May 4, 2000 Philip Morris presentation as "hospitality allies" who were mobilized to help defeat smoking restrictions in a number of locations around the U.S. The American Beverage Institute has also served as a tobacco industry front group and a mouthpiece organization for the tobacco industry. In 1999, the American Beverage Institute published a study performed by KPMG Peat Marwick titled "The Impact of 1998 California Smoking Ban on Bars, Taverns and Night Clubs: A Survey of Owners and Managers." The study surveyed bar owners and managers, asking whether business increased or decreased after January 1, 1998, the date the California bar ban went into effect. It claimed to find that business declined an average of 26.2%, but no hard numbers were used to arrive at this percentage. Rather than look at objective data like actual sales receipts, the ABI survey merely surveyed the opinions of bar owners. Numerous other studies have examined the effect of smoking bans on the hospitality industry, and studies that actually look at taxable sales receipts show no significant impact. Rick Berman, general cousel for ABI, also serves as a consultant to Philip Morris (PM). 1999 tax Form 990 showed Rick Berman as Executive Director of the Guest Choice Network. Guest Choice Network, the American Beverage Institute (ABI), the Employment Policies Institute, and (Rick) Berman and Company in March, 2001 all shared the same address: 1775 Pennsylvania Avenue, NW, #1200, Washington, DC 20006. Richard "Rick" Berman, general counsel for ABI, is also the creator of the Guest Choice Network. 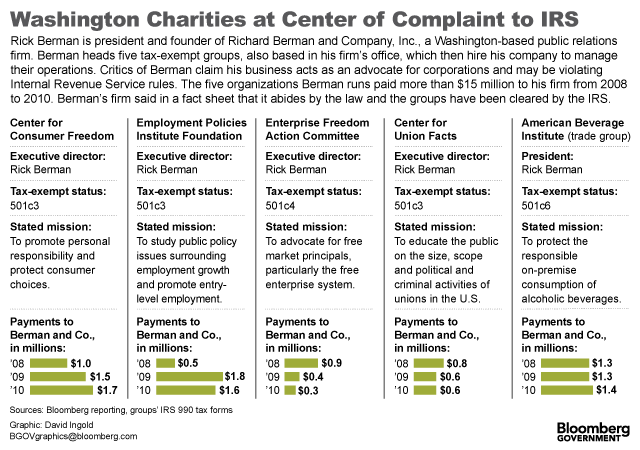 Berman and Company and the Employment Policies Institute also share a fax number. An internal PM document shows that PM sought Rick Berman's help to implement its Accommodation Program in hospitality venues, a strategy designed to stave off clean indoor air laws nationally. In January 2009, the ABI opposed new laws that became effective in six states that required the installation of ignition interlock devices in vehicles belonging to people convicted of their first drunk driving offense. ABI Managing Director Sarah Longwell argued, "We foresee is a country in which you're no longer able to have a glass of wine, drink a beer at a ball game or enjoy a champagne toast at a wedding." She added, "There will be a de facto zero tolerance policy imposed on people by their cars." Longwell argued that Mothers Against Drunk Driving (MADD), who supported passage of the laws, put too much emphasis on alcohol as a cause of traffic deaths, and disregarded the roles excessive speed and driver cell-phone use in deadly accidents. Shifting the focus of the debate away from the embattled substance/product is a public relations strategy first practiced by the tobacco industry. Richard Berman, President, Director, General Counsel. Berman also held the books for ABI. ABI is registered with the IRS as a 501(c)(6) trade group. American Beverage Institute, "The New Killer on the Road: Distracted Drivers", PR Newswire, March 6, 2007. ↑ American Beverage Institute, American Beverage Institute, accessed March 2008. ↑ B. Trach, "Background for Meeting 951020 Re: Industry Leaders and the Accommodation Program", Philip Morris USA, October 19, 1995. Bates Number 2072148763. ↑ 6.0 6.1 American Beverage Institute, "2014 IRS Form 990," organizational tax filing, November 11, 2015. Archived by ProPublica.